It is hard to believe that it's been a year since we traveled to the Beaumont area after Hurricane Harvey devastated the Gulf Coast area of Texas, and yet a year later many thousands of people are still waiting to return to their homes and families. The churches of T2C2 are planning a return trip, this time to the Houston area, to help the victims as they continue to clean up, salvage, and restore their homes. We will be looking for a point person at each church to help with the planning and organizing. As August becomes September several things are in transition. Students start going back to school, the hot summer finally starts to cool off and athletes of all kinds take to the field and courts of competition. This is also true for the La Paz teams sponsored by the partners of T2C2. La Paz currently has teams based out of Irving, Arlington and North Dallas with teams starting to form in East Dallas. 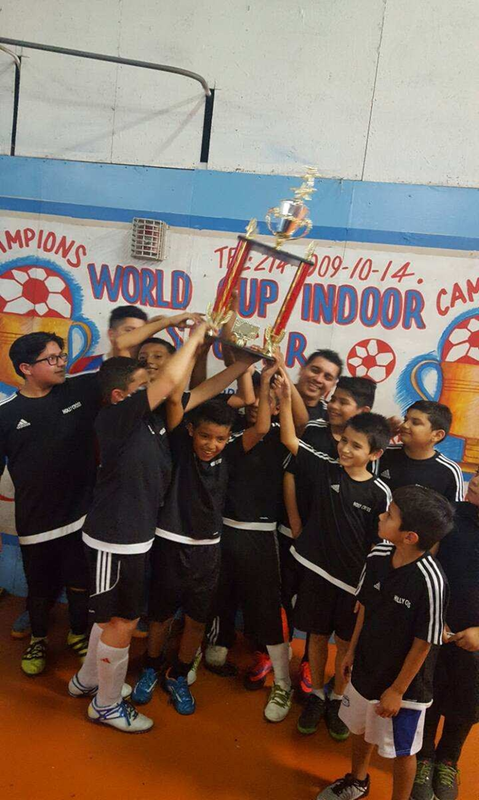 La Paz is about more than just soccer as prayer, Bible study and character formation is mixed in with games, drills and practice schedules; even evotions in the parking lot while tailgating at an FC Dallas game. Our players and their families also have the opportunity to connect to a local church, faith community and pastoral support, where they can grow as followers of Jesus. Through this many have been baptized, received 1st Communion, Confirmation instruction and gotten involved with youth and family activities. 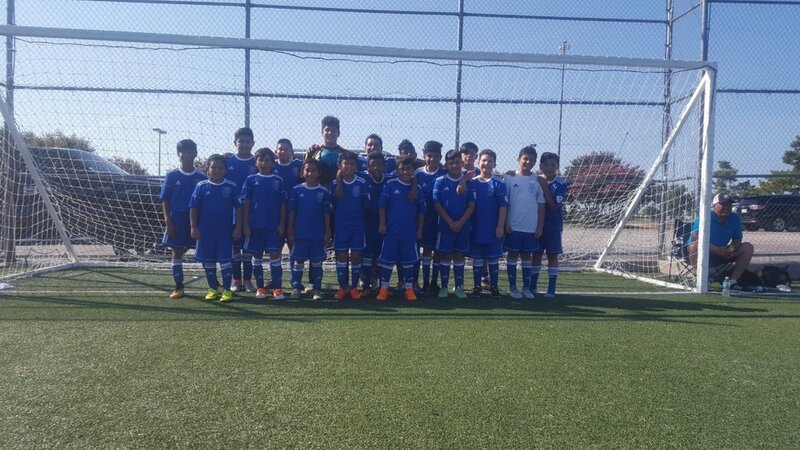 Your support of T2C2 on North Texas Giving Day allows many students and their families to participate in La Paz Soccer, when they otherwise would not be able to afford to. Thanks again for your support of T2C2 and La Paz as we together make winners on and off the soccer field. For students, parents, teachers and many others, May represents the end of the school year. This is a time full of graduations, finals, events and celebrations. For the churches of T2C2, May is when we wrap up another year of weekly Family Nights that include ESL classes for parents and a variety of activities for children. Megan Armendariz, the Administrative Assistant for T2C2 and La Paz also serves as an ESL teacher at Holy Cross/Santa Cruz in Northwest Dallas; which recently completed its 5th year of outreach to the community. Enjoy this article where she reflects on how Wednesdays have become a night where many groups come together under one message; the Good News of what Jesus has done for them. Wednesday evenings during the school semesters at Holy Cross are a great intersection of ministries. HC Dallas, the La Paz teams coached by Luis Benitez, practice at Holy Cross on Wednesday evenings. While those practices are happening, adult ESL classes are happening in the classrooms down the hall. In the Children’s Ministry room, in the computer lab, or in the gym, youth activities are scheduled in a variety of subjects and include devotions, games, sports, computer class, and other activities. The three groups rotate between a time in the Fellowship Hall, where a monthly rotation of volunteers serve a snack or light dinner and drinks. In the majority of cases, more than one person from a family is participating in WILD Wednesday activities. Prior to holidays or in celebration of community events, there will often be a party in the Fellowship Hall for all to gather at the same time. All of these activities and volunteers are coordinated by Sarah Burr, who is a bilingual missionary who works at the local YMCA. She has the opportunity to serve the families of Santa Cruz, Holy Cross, La Paz, and the YMCA on Wednesday evenings, and each of the groups are represented on a typical night. The needs and passions of the community are served by making full use of the campus of Holy Cross and the desires of community members to serve and share the Gospel with the people around them. 100 Miles Finished, Many Miles for Missions to Go! This last weekend I had the privilege of of joining Pastors Eloy Gonzalez and Harry Smith on a 100 mile bicycle journey across the Lower Rio Grande Valley in South Texas. This ride was in part to show support for our pastor brothers facing great difficulties as they serve in the Lutheran Churches of Mexico. While we believe strongly in the mission work T2C2 is doing here in the DFW Metroplex we are also mindful that there is much work to do beyond here. Pastor Eloy organized this ride, so enjoy this article as he gives a great explanation for what motivated him to spearhead such a journey. A future ride to support T2C2 and La Paz is in the works for 2018 and in the mean time you can support T2C2 directly here. Spin the pedals at about 80 revolutions per minute for about six and one-half hours and you will have traveled about 100 miles. Hopefully that four-letter word, “Wind,” won’t be howling and the temperature will be neither too hot, nor too cold. If all goes well, neither “cramping” nor “bonking” will become issues, because either of these could put an end to any hopes of finishing the course. What am I talking about? – Why the one-hundred mile Pico de Gallo 100! This is a one-hundred-mile bicycle ride that took place on December 2nd in the Rio Grande Valley. Three pastors associated with T2C2 took part in this ride: Pastors Chris Holder, Harry Smith and Eloy González. Why did these pastors train for this bicycle ride? – 1) to raise awareness for the mission of Christ that begins right outside our front door! Our prayer is that this participation will - in a fun way - draw attention to work that our good and gracious God has given us an opportunity to do. 2) to ask for your support in the form of prayers and finances and service. With this kind of support, we will be able to insure the continuity of “missions near” and “missions far”. “Missions far” means KIMA – the organization that helps support a number of the impoverished Lutheran ministries in Mexico. Through KIMA’s ministry, Bibles and VBS materials are provided to congregations in Mexico so that children and pastors can have what they need to make disciples for Jesus. And, in some cases, KIMA provides a small stipend to needy pastors and pastors’ families to help them with basic needs. Missions near – means the nations that are right in our very own communities. People from all over the world are moving into the very neighborhoods where our LCMS congregations are losing membership and, in some cases, struggling to remain open. It is precisely these congregations with whom Our Redeemer Lutheran Church has purposed to enter into partnerships. Through those partnerships, we hope to support the cooperative work being done with T2C2, Faith Lutheran Church and Our Redeemer Lutheran Church. The Pico de Gallo 100 is a fun bicycle ride. We pray that by participating in this event, we helped to raise awareness for the mission of Christ. Our hope is that by doing this we were able to get greater participation in the form of prayer, financial support and active volunteer support for the mission of Christ. Are you able to help? Let us know if you can become a regular prayer partner. If you are able to offer financial assistance, please visit: www.youcaring.com/orlc. And if you are interested in being actively involved in any of the T2C2 ministry efforts (including the Pico de Gallo 100 bike ride! ), just let us know. T2C2 is founded upon walking along side churches and other partners to accomplish three core activities: Developing Communities, Planting Missions and Developing Leaders. One of the ways one of ways community development has happened in our network is through strategic partnerships between our churches and local public schools. Over the last five years Holy Cross in Northwest Dallas has established very strong partnerships with two schools in it's community. Angie Nitz, who serves as the Director of Community Care at Holy Cross, reflects on the impact of these partnerships over the last five years. Five years later, we have seen countless doors opened and meaningful relationships cultivated. In addition to small things like serving meals to the faculty and collecting school supplies for students and teachers, the mutual respect between the schools and church has allowed us to go further. Our staff members serve on the Site Based Decision Making Teams for each school which allows us to be a part of helping to shape the direction of each campus and gives us an opportunity to hear about issues facing school families so that we can better serve them. Additionally, at Gooch we now recruit and train Reading Buddy mentors who meet weekly with a student to practice literacy. This year we have our largest group of volunteers yet and are currently serving 24 students weekly. The program continues to grow mostly through word of mouth as our volunteers tell their friends about the impact being seen. In addition, through our partnership with La Paz, Luis Benitez (our Director of Hispanic Ministries) coaches a soccer team for Gooch students. Once a week the team meets at Holy Cross for practice, a meal and devotion/prayer time. At Marsh, Holy Cross staff members teach a character development course twice per month through the Leadership Cadet Corps. Though this course is not a Biblical curriculum, it allows us to cover many Biblical principles such as treating others as we would like to be treated, etc. As a result of the relationships made and cultivated over these last several years we have seen exciting developments. Many of the children and families involved in our summer camp ministry, soccer team and WILD Wednesday midweek program have come to us through our presence in the schools. This has meant that in addition to providing for physical and educational needs in the schools, we are also able to share the Gospel on a regular basis with these same families in the after school hours. The last five years have also brought many positive changes to the schools we serve. Both schools have shed an “Improvement Required” designation and have seen sharp improvement in student achievement, attendance and retention. This is largely due to some incredible leadership and talented, dedicated and hardworking teachers. That day in her office, however, Principal Bujanda pointed out that these were not the only factors in their turnaround. I knew what she meant. God has continued to “stick by us” too; opening doors and fostering relationships that allow us to continue to serve. Our ministry to school children today looks very different from what it did a decade ago but our Jesus doesn’t. He’s the same yesterday, today and forever! Earlier this month a team of 15 volunteers from the T2C2 churches traveled to Beaumont to serve alongside those impacted by the recent hurricane. In addition to the trip itself over $4,000 was donated and many supplies collected to help families impacted in the Gulf Coast and relocated here in Dallas. Thanks again to all who have supported this mission effort. The restoration work will continue for months and plans for future T2C2 trips are in the works with dates to be announced soon. Pastor Harry from Our Redeemer/Faith helped organize this trip and here are some of his personal reflections on the work we were privileged to be a part of in the name of Jesus! "We came to Beaumont not quite knowing what to expect. We were met by a list 60+ projects long, each of them requiring several difficult hours of work. On Thursday, my crew had the opportunity to help rebuild a roof on a mobile home for a woman and member of St. John Lutheran in Beaumont whose house had burned just two days before the hurricane arrived. The house was truly in bad shape — we had to cut out the old wiring and bolster what was salvageable of the old rafters. After that, our team installed new gussets to prepare to lay the chipboard base for the roof. After a day and a half, we were able to put a roof on this woman’s home. Steve Lockhart and Fred Heiner (our project directors) told us that this woman, who was elderly, had nowhere else to turn if she couldn’t get her home back. We returned that evening to the church to prepare for a final day of work. Overall, it was a true joy to be able to serve and sweat with these individuals in the Beaumont area. We had an opportunity in our devotion each night to reflect on asking the Lord for help, receiving what he has for you, and serving when he opens the door for you. You never know what opportunities the Lord will bring into your future. But, as Paul often writes in his letters, I left feeling encouraged by our brothers and sisters in Christ — from the cooking crew to Pastor Jim to Fred, Steve, and others who helped coordinate our projects, as well as those who served with us and whom we were able to serve." July was a big month for the churches of the T2C2 Network. On July 2nd, the Rev. Chris Holder and Rev. Edilberto (Beto) Alzate were installed at Bethel Lutheran Church in Dallas as Pastors of Community Outreach and Hispanic Ministries. This marks an expansion of the work that began in 2016 when Bethel became the fourth church to join the T2C2 Mission Network; in order to start new outreach initiatives to its changing communities. The leaders and pastors from the T2C2 churches including Faith, Holy Cross and Our Redeemer showed their support by leading the service and were joined by many pastors from the DFW area. In addition to the hard work we reflected daily on what it means to be an Echo of Christ. It was great week of service and learning side by side with a partner ministry in another city. These posts and the quarterly T2C2 newsletter are my chance as Director to share a few of the ways I see Jesus working through the T2C2 mission partnership. As always I thank everyone for their support of the network and taking the time to read these updates. While T2C2 serves in an important support and collective mission focus capacity, the vast majority of the mission work is still developed and being carried out by the local partner churches. This is an important part of the T2C2 strategy. However, we also recognize the need to keep a strong line of communication with staffs, leaders, and the four unique mission sites in the DFW area. With that in mind I see a big part of my role is making sure we are doing activities that intentionally promote interaction between the mission sites and other partners. One way we are doing this is by having joint staff meetings every 2-3 months. At these meetings we gather at one of the partner sites around a meal, devotional study, and mutual sharing on how we see Christ is working among us. These meetings, along with the monthly meetings that Pastor Juan Zamora leads for the Hispanic team, serve to increase communication and help us all feel a part of something bigger. Another way we are working together in the network is by joint youth events including our first T2C2 mission trip this summer. During the week of July 8-15, 25-30 youth and adults from the four T2C2 churches and our La Paz soccer teams will be going to St. Louis for a week of work projects and soccer camps. We will be working with a couple of organizations, Acts 1:8 Ministry and Extreme Faith, to spread to the love of Jesus and soccer to families in the St. Louis communities. Strategic partnerships with our local public schools continue to be an important part of how we connect with people in our communities. Through these partnerships we are able to mentor students, expand our soccer ministry to their fields, and build relationships with the school staffs. Staff and volunteers from Bethel and Holy Cross showed the love of Christ and their appreciation to their partner schools by feeding entire staffs of Gooch and Highland Meadows Elementary and Marsh Prep Academy during Teacher Appreciation Week. These are but a few of the ways T2C2 and its partner churches are working together and creatively engaging their communities with the gospel of Jesus Christ. “Liminality!” This is a truly interesting term. It describes the confusion and sometimes disorientation that happens when people are passing through a state of transition. Think of a young person as he/she moves from being a child completely dependent on his/her parents. Not quite an adult; no longer a child. The confusion that brings on can be described as a period of liminality. There is confusion. There is disorientation. There is a search for how to belong and now to move forward. The church and denomination in which we grew up in finds itself in such a situation. The church used to represent the best in society. The adage, “Build it and they will come,” describes the only thing that churches needed to do to get people to fill the pews. Now society has changed. The mores and values in society have changed. “Build it and they will come,” no longer works. Liminality! We are living through a time of disorienting and confusing transition for many congregations. This is causing many of them to shut down in record numbers. This transition time is when a partnership like the one with Faith–Grand Prairie and Our Redeemer–Irving can be a blessing: the sharing of people and resources. The purpose is to assist both congregations not only to survive, but to thrive in a period of liminality. Pastors Juan Zamora and Harry Smith serve both churches. They have engaged the task of not only serving God’s people in those congregations, but also have committed to developing strategies and activities that will help connect the community to these congregations. 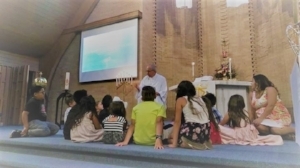 Everything from soccer to after-school children’s programs and more have been started at FLC in order to reach into the community and connect them to the congregation. “Liminality” is being taken on and the prayer is that both ORLC and Faith can thrive in this time of transition that is challenging so many congregations. We ask for your prayers for these efforts as the Gospel is advanced and the darkness is challenged and “liminality” is turned on its head by power of the Holy Spirit. The Lord of the Harvest continues to gather new workers, and grow the leaders who are training with T2C2. In addition to Nelson Ortega becoming a Vicar at Our Redeemer–Irving as part of his seminary training, and Luis and Mirella Benitz taking the leadership roles of Santa Cruz at Holy Cross–Dallas, several leaders in training are taking significant roles at the T2C2 Mission sites. Please keep these leaders including Salvador Guevara, Monica Lobos and Ruth Durand in your prayers as they all continue their growth as leaders and pre-seminary studies. Two of our newest leaders, Consuelo and Marco Martinez, are now assisting Pastors Juan Zamora and Harry Smith with Comunidad de Fe at Faith–Grand Prairie. They have begun the pre-seminary classes and are using their gifts in a variety of roles in service to God and Faith. Consuelo and Marco currently live in Fort Worth and have served their community for several years, primarily through support groups. We are thankful to both for their hard work and dedication to the Lord. As the lead T2C2 mission developer, Pastor Juan gathers monthly with our group of Hispanic Ministry Teams for training and to celebrate the things that Jesus is doing among them at the various T2C2 sites. At these meetings they have the opportunity to reflect on God’s Word and share the areas in which each is growing personally and being formed in their faith. These gatherings also include time for the group to pray for each other and hear words of encouragement. Megan Szabo joined T2C2 in April as the La Paz coordinator. She also serves as the administrator for Holy Cross–Dallas. Megan is originally from the Chicago area, and she loves cycling, road trips, coffee, and watching soccer and Blackhawks hockey. She was a Spanish major in college and lived in Spain for a year. Megan is looking forward to the opportunity to use her gifts and studies to connect with people in their first language. She has already helped with several projects, including the FC Dallas game outing. On May 20, more than 150 soccer players and their families from the La Paz soccer club teams gathered in Frisco for the FC Dallas match against the San Jose Earthquake. Players from Arlington, Grand Prairie, Irving, North Dallas and our newest La Paz location in East Dallas were all represented. This was the first time we were able to gather this big of a group from all our La Paz teams. The groups started arriving in the parking lot for tailgating and fellowship. After 150 burgers and 300 hot dogs were consumed by all the participants, Pastor Juan Zamora gathered everyone together and stood in the bed of a pickup truck. From there he delivered a brief but powerful message to remind everyone that this gathering in Frisco and La Paz is about more than soccer. It is the opportunity for to connect with the Gospel of Jesus and grow in their understanding of Him. This event is similar to the interaction with Paul and the Athenian Philosophers from Acts 17. Here we see Paul troubled by all the idols and false God’s among him, but not attaching or pointing out the flaws of people’s beliefs. Instead Paul calmly and cleverly builds on and turns upside down their zeal for learning, even going as far as calling them very religious, so religious that they even built an idol to an unknown God. Paul went one to make this “unknown God” known by connecting him to the God who made all people, calls us his offspring and shows his justice in raising his son Jesus from the dead. So whether it’s Pastor Juan from the bed of a pickup truck in front of the La Paz soccer teams or Paul in Athens in front of the great philosophers of his day, we see the Gospel of Jesus being spoken as it is being built upon what people already have a passion about. Having received a firm and enthusiastic response it was agreed to have services on Friday evenings at 7:00 pm, twice a month. The first Spanish service was on April 7 with more than 35 people in attendance, with the support from those attending continuing on a strong course. The second service was on April 28, with the turnout about the same, and by May 12 the number of worshipers was increasing. The new worshiping community is calling itself La Casa de Dios (The House of God). This comes from the Hebrew origin of the word Bethel as the dwelling place of God. The Hispanic Ministry officially launched at Bethel in 2016 with a Back-to School blessing in August and Wednesday Night ESL Classes in September. More than 30 adults and children participated in the classes on a weekly basis. Pastor Beto also developed relationships with these families and others from our partner DISD school, Highland Meadows. From there he started offering pastoral care, parenting classes, Bible studies, soccer at Highland Meadows and other opportunities to engage these families. During the week of March 22-26, T2C2 partnered with the University of Texas–Arlington Lutheran Student Center to host a mission team of college students from the University of Wisconsin. They were led by their campus pastor, Rev. Dan Anderson, a seminary classmate of T2C2 Director Rev. Chris Holder. Here is summary of their week of service in the DFW area. Greetings from Calvary Lutheran Church in Madison, WI. During spring break we took a trip to Dallas to serve side by side with Pastor Chris Holder and T2C2 ministries. We were blessed to serve with some amazing people and enjoyed some delicious food along the way. Thursday we went site seeing in Dallas and enjoyed some delicious Texas barbecue. The rest of our day was spent serving in the community by handing out flyers for some events at Faith–Grand Prairie, setting up for a garage sale at Bethel, and helping with an ESL event at Our Redeemer–Irving. Friday we ventured over to volunteer at North Dallas Shared Ministries. If you haven’t heard about them, I would highly recommend going over there and talking to Judy Rorrie. She is one of the nicest ladies (she’s from Wisconsin) and they are doing some truly amazing things over there. From a food bank to a full-blown dentist office, they are doing so much to help low-income families in North Dallas. In the evening we helped prepare a Biryani dinner at the UTA Lutheran Student Center and taught them some Christian songs. Saturday we served Faith with their community outreach by helping them run a soccer camp and spent the evening site-seeing at the Stockyards in Fort Worth. Sunday was our last day in the Dallas area. We worshiped in English at Faith and Spanish at Our Redeemer, had some Texas chili and then headed back to Wisconsin, exhausted from our incredible week of service with T2C2. We would like to thank the members of Holy Cross, Bethel, Our Redeemer and Faith for being so welcoming and working alongside us to serve the Lord. We would also like to send out a huge thank you to Pastor Naveen Nischal and the Lutheran Student Center at UTA for housing us for the week. Luis & Mirella Benitez were commissioned in February 2017 as the new leadership team for Santa Cruz, the Hispanic Outreach ministry at Holy Cross–Dallas. Luis and Mirella have been a part of the Santa Cruz ministry for more than four years and are the first T2C2 Mission Workers in Training to take the lead role at one of our mission sites that has been introduced. Hello. We want to start by introducing ourselves. Our names are Luis and Mirella, and we have been part of Santa Cruz since April of 2013. We first came here by an invitation we received from the school for festivities that were going to be held at Santa Cruz for “El Dia del Nino”. We came and saw that service was held on Sunday evenings and started to attend. We had been looking for a place of worship and we were already reading the word of God at home and within a few months Santa Cruz became our place of worship. Our experience here has been heaven sent. We were looking for a place of worship and we found more than that. God would soon show us that this was not just a place of worship, but also a part of his plan for us. We became part of a family with Pastor Juan and Alma Zamora along with the members of the congregation who welcomed us into their hearts. We began to grow together become a part of the ministry, along with being involved with the community. God keeps on shaping our path. He opened the door and pointed us in a direction that we hadn’t planned for. It is God’s plan and we are happy to be part of it. Being part of leadership in a growing ministry where we can reach others is a blessing for us. And, we continue to reach out to others, not only with the word of God through Bible study, but also with community outreach programs like soccer or helping the less fortunate. This ministry also helps us grow and mature in a closer relationship with God. We hope that in the coming years we can be of service to others and make a difference, just as the difference was made in our lives with the hand of God and the continuing support of our Pastors and members of Holy Cross. Two of the T2C2 partner churches, Our Redeemer-Irving and Holy Cross-Dallas have been engaging in an ongoing sandwich ministry. One Saturday each month, people gather to assemble as many sandwiches as they have supplies for, often more than 1,000, that are sent out to support ministries to the homeless in downtown Dallas. These Sandwich Saturdays not only do a great service to the greater community, but they also provide an opportunity for people of different ages, interests and backgrounds to come together for a common goal. This has also been a great opportunity for some of the new workers in training to step up and take bigger, more hand-on leadership roles. Many of the volunteers who donate supplies and their time come from the community outside of the church, giving Our Redeemer and Holy Cross an opportunity to show goodwill to their neighbors as they live out Jesus' words, "I was hungry and you gave me something to eat." Nelson & Gloria Ortega- Originally from Honduras, Nelson & Gloria are members of Our Redeemer-Irving. Their first explosure to ORLC was through the ESL ministry. From there they became involved in the Spanish worship services and eventually Nelson became one of the service leaders. Now Nelson is enrolled in pastor training classes at the Center for Hispanic Studies in St. Louis. He continues to help lead the Spanish worship services and assists the pastoral team of Our Redeemer in a variety of roles. Luis & Mirella Benitez- Originally from El Salvador, Luis & Mirella first came to Holy Cross from our school partnership after receiving an invitation to an outreach program Dia del Niño. Along with their family they started attending one of the Spanish Bible studies and became involved with Club La Paz where Luis coaches one of the teams. Since then they have become active leaders and members of Santa Cruz. Luis is being trained by Pastor Juan and others to be a future leader of Santa Cruz. He will soon be ready to apply to Seminary for pastor training. Monica Lobos- Originally from Argentina, Monica came to Our Redeemer through a friend who invited her. She then became a member and leader in the Spanish Sunday School. Her daughter was accepted to on of the charter schools in Grand Prairie which opened the opportunity for her to be a leader at Comunidad de Fe where she is helping with children's Bible studies and helping to start a Zumba ministry. She is also going to be starting her first pre-seminary class in October. Holy Cross and Bethel, two of the T2C2 partner churches, are located near public schools in Dallas. As part of their service to the community Holy Cross has been a strategic partner with Gooch Elementary and Marsh Middle Schools for several years. People from Holy Cross and the surrounding community serve as reading buddies at Gooch, and they have also helped the Gooch PTSA with their annual Gator Fest celebration. At Marsh, the Holy Cross staff teaches leadership and life skills to the JROTC Cadets twice a month. The staff also provided a great, catered barbecue lunch with a drawing for Walmart gift cards for the teachers and staff. More than 125 teachers and staff were served that day and were very gracious–several commenting that they were blown away by the hospitality. Bethel has started a similar partnership with Highland Meadow Elementary School Why do we do this? We simply do this so that we can show the tangible love of Christ to people that serve our greater communities. Not only did the staff at Marsh comment on how great the food was, a few also thanked us for lifting them and the students of Marsh in prayer and even expressed an interest in Holy Cross serving the school in a more spiritual capacity; perhaps even leading a Prayer Walk through the campus on a non-school day. While we do not know what plan God has for these partnerships, in all there is an open door to explore this outreach even further. 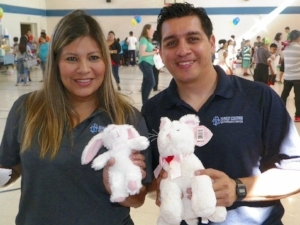 One example of the gift of partnerships is at Holy Cross where families, like Luis Enrique and Mirella Benitez who are key leaders at the Santa Cruz Hispanic Mission, came to us through events we worked on with our school partners.